Trees naturally have some debris such as old needles, leaves, etc., particularly in the middle part of the tree. At Indian Rock Farm we use a tree shaker (called a Shakee) to remove any of this material so it won't end up on your floor. "Shaking the tree" usually brings out laughs from adults and children! 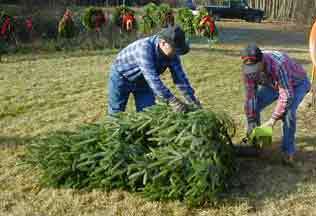 We always make sure the tree has a nice straight, fresh cut at the bottom before we wrap it up for you. We can cut the tree to the length you desire. 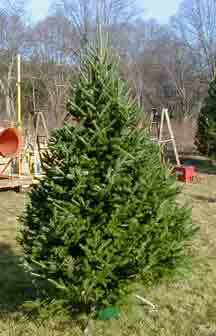 This clean and square cut also makes the tree more stable in the stand and helps the tree absorb water. Another great convenience is the net-wrapping. 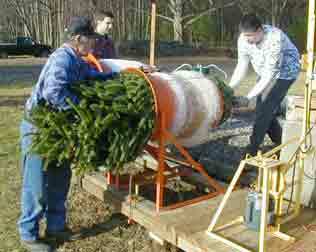 We pull the tree through a large "funnel" and the net wrapping is applied to the tree. This service makes it much easier to transport the tree, bring it into the home, and provides protection so tree branches don't get inadvertently broken while handling the tree. 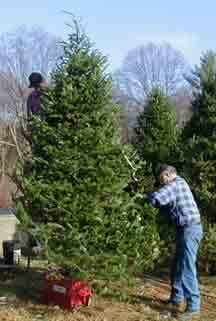 We also provide heavy duty twine to secure the tree onto your car, free of charge. 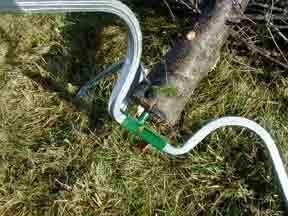 We offer the Stand Strait Tree Stand system. 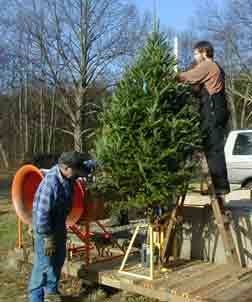 This has often been called the "marriage saver" because it makes erecting the tree effortless. No need to "sight" the tree and no bolts to screw in. It is possible for one person to do alone (depending on size). Also, less of the trunk is needed on the tree, making it ideal for lower ceilings or if you don't want the bottom to look as empty. We cut the tree to the length you need. Then we hold the tree upright and straight in our special drilling machine, where we drill a special tapered hole in the bottom of the tree. There is a pin in the bottom of the stand that is inserted into the drilled and tapered hole. You simply insert the pin into the hole, then tap on the bottom of the stand to wedge the pin into the hole. Finally, stand the tree up where it is. It will be straight and very well supported. Doing this while the netting is still on makes the process easier and protects the branches. Once up, just cut the netting off. People tell us how much they love this type of tree stand.